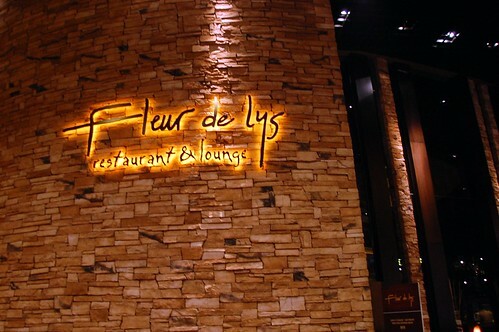 Upon landing Friday night in Las Vegas, I made a 10 p.m. reservation at Fleur de Lys via my OpenTable iPhone app. Gotta love technology. 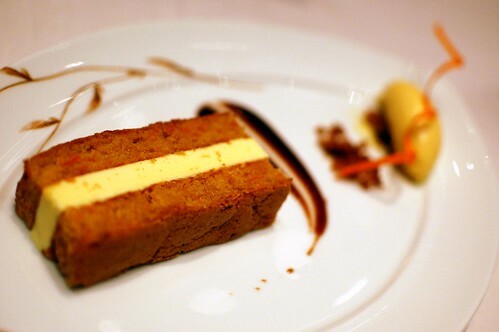 While Chef Hubert Keller is rarely at the helm of this outpost, we were excited to try the restaurant, especially with our $50 restaurant.com gift certificate that we'd bought for only $2. Who could turn down $48 off a meal? Not us. 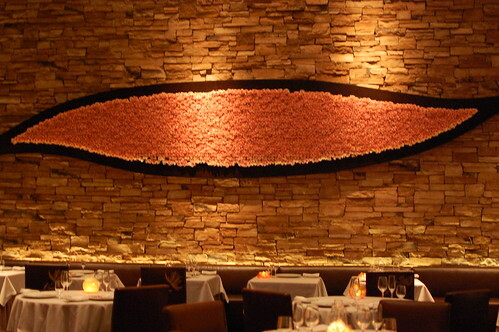 I was obsessed with this wall decoration. 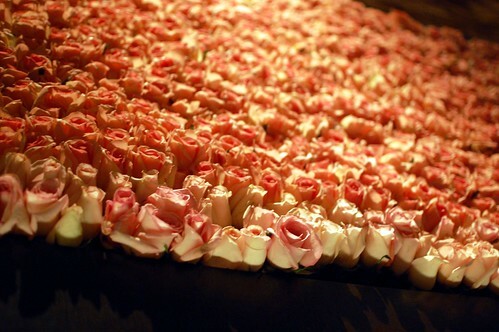 All real fresh roses. Kind of thrilling. Warm and fresh and constantly replenished. Because it was so late, we opted for the four-course Elegance Menu ($89), as opposed to the full-fledged signature tasting menu ($145). 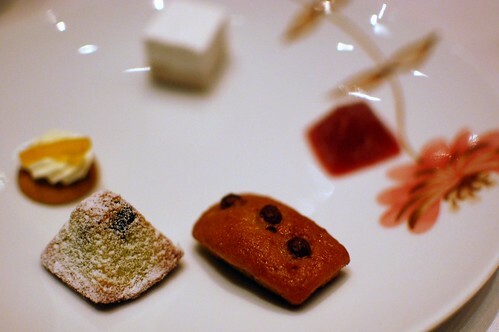 There were two options for each course. Naturally, we got one of each. 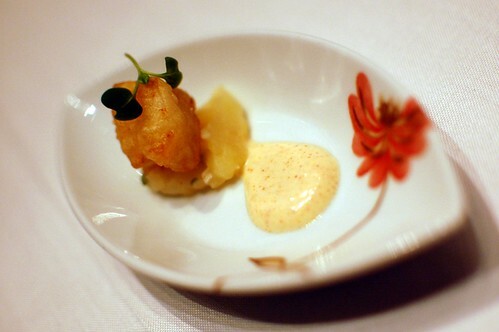 This little fried cod bite left us wanting more. Truffled onion soup, braised duck crepe, red wine onion puree, black truffle. Exquisite. So many rich flavors melded together. 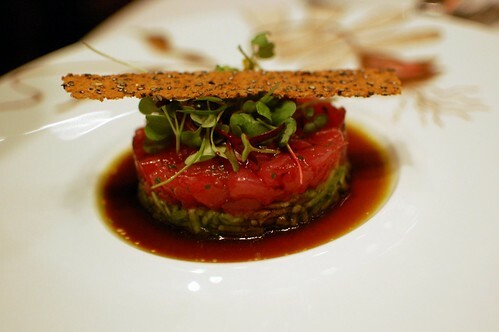 Ahi tuna tartare, shaved fennel slaw, ginger ponzu, fennel seed tuile. Gorgeous and luscious. 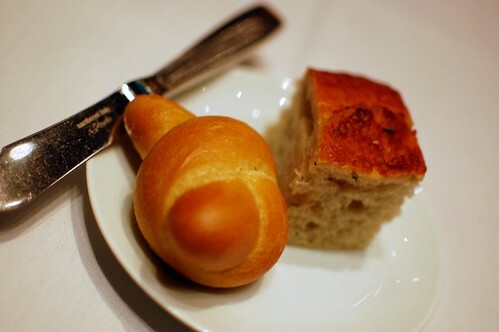 A cool complement to the warm onion soup. 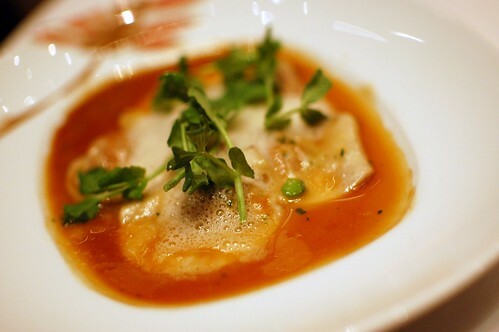 Braised veal and Yukon Gold potato ravioli, sunchokes, English peas. Whoa. Super melt-in-your-mouth yummy. My favorite course of the night. 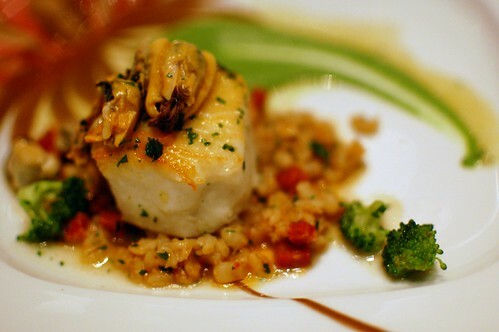 Citrus-glazed halibut filet, clams, mussels, chorizo, young broccoli florets. Nicely done but not our favorite. 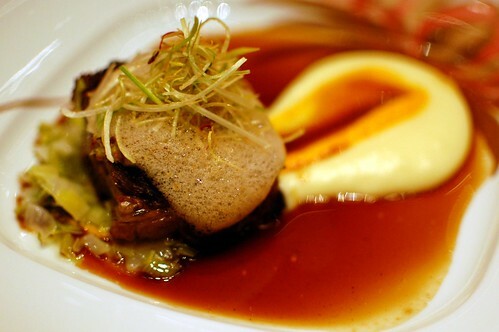 Stout-braised beef short ribs, melted leeks, potato puree, house-made mustard. The meat was great, but the smooth and creamy Georgia O'Keefe potatoes really won us over. Tee hee hee. 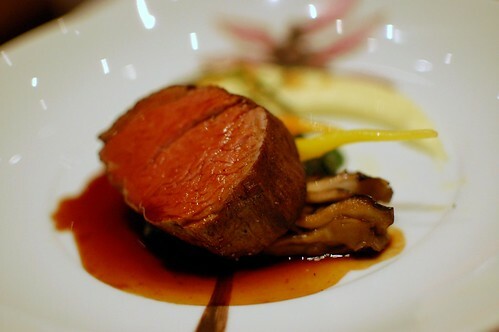 Prime filet mignon, baby spinach, wild mushrooms, salsify, red wine reduction. 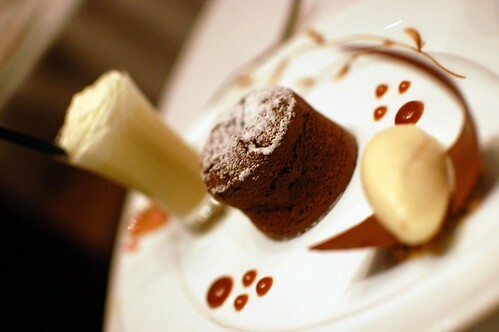 Valrhona chocolate banana cake, peanut butter cream shake, Bailey's ice cream, caramel sauce. I thought the Bailey's ice cream would be the winner. Nope. I almost licked the peanut butter cream shake glass clean. Spiced carrot and cream cheese ice cream sandwich, pineapple carrot ice cream. Moist and lovely and not too sweet -- just the way I like my dessert. Mr. Monkey downed this, so he could stay awake the rest of the night. Vegas! Yeah! Looked cute. Tasted cute. Yup. It tasted cute. We enjoyed our meal very much, and service was wonderful. I must admit, however, that I'm not sure it would've been worth it without our $50 discount. 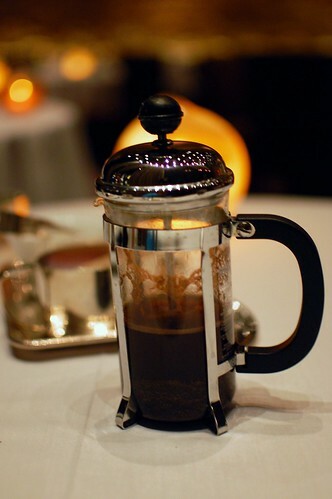 For a similar price, you could get a truly mind-blowing experience at L'Atelier de Joel Robuchon or a more beautiful meal at Aureole. I'd definitely return with another $50 gift certificate, though. That looks like a great "quick" meal. 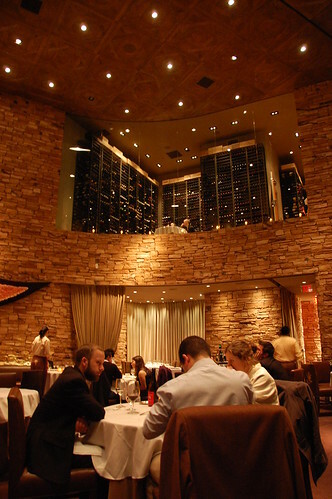 Next time I go to Vegas I am packing several restaurant.com gift certificates. awesomeness. that soup looked stellar! I made sure to eat lunch before looking at your post today. It was a wise choice because of course all your posts make me hungry. i find it interesting that they use plates with designs on them rather than the usual stark white plates that most restaurants use to better showcase their food. that restaurants.com deal sounds great! i may have to rethink my opinion of restaurant.com. I saw the one in SF but couldn't go in #1 because it was closed and #2 it was waaay out of my price range. I will have to look into these gift certificates you got! Sounds like a great deal! That wall decoration is insane! how did you manage to get a $50 gc for $2? dang. so what time did your husband go to bed after all that coffee? I need more coupons in my life! I love the flikr pictures of the soup. Very creative! LMAO @ "Georgia O'Keefe potatoes"